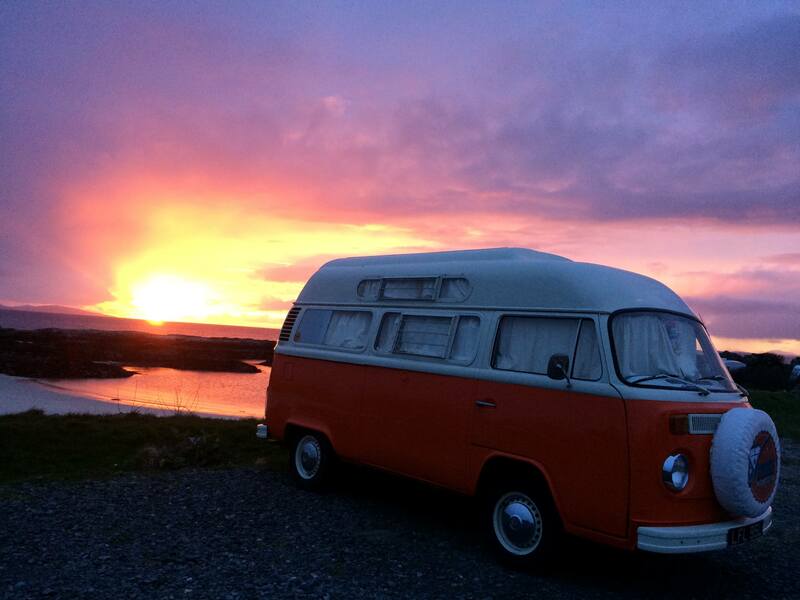 Why Hire a Vintage VW Campervan to Tour Scotland? Why do Vintage VW Campers have such an enduring appeal? Buckle up and get ready for the ride, speed is not of the essence: making memories, adventure, chilling out and freedom, that’s what it’s all about. Back in the 1960s and 1970s these ready-made holiday homes on wheels met the leisure needs of three generations. Family holidays could consist of granny, parents and children all bunked up together inside a campervan. Those who were the youngest generation in the 60s and 70s campervanning heydays are now the grandparents or at least the parents choosing their family holiday destinations. There’s no doubt these people look back fondly on their long and sunny family holidays and want to recreate them. There are also those who always envied their pals in campervans, while they roughed it under canvass in a tent and have nursed a desire to go on a campervan holiday ever since. These VW Type 2’s, both the older T1 Split Screen, available from 1950 and the T2 Bay Window, which took over in 1967 are incredibly cute and stylish to many people. “They are just so well designed and I think they have such friendly ‘faces’.” One member of the Lothians’ Volkswagen Club confided. So the interpretation of the front of campervans appearing to have eyes and a nose (represented by the headlights and spare wheel) is what strikes a chord with some people. Undoubtedly the essential practice of giving a name to your campervan helps make them one of the family too. It could be this which causes people as young as five years old to fall in love with VW Campers as well. A few Vintage VW Campers guests booked because of a child’s obsession with the vehicles. Their parents often didn’t know where the love had come from. But why explore Scotland in a Vintage VW Camper? The flexibility and practicality of, like a tortoise, having your home with you as you travel is also part of the appeal. Like the view? Park up and stick the kettle on for a brew, no reason not to linger. Wherever you park up can be your home for the night and that is one reason why this mode of transport is so good for travelling in Scotland. The idea of chasing the sun in a campervan is also of particular resonance in Scotland, a country famous for sometimes giving us ‘four seasons in one day’. Don’t like the weather in one spot? No hassle of packing up a tent wet and pitching again at another location, just follow the weather forecast to a sunnier area, park up, pop the roof up and stick that kettle on again. As most of Scotland’s relatively small population lives in the central belt, that leaves a lot of wild land to be explored. It also means a big responsibility to all who enjoy Scotland’s wild places; we are all responsible for the future of plants, animals and biodiversity. Enjoying the countryside with the ‘leave no trace’ challenge at the forefront of our activities is imperative for sustainable tourism. Thus allowing generations to come, the same pleasure we can have now. Whether you get your outdoor kicks from surfing, hillwalking, climbing, golfing, beach-combing, star-gazing, aurora chasing or even just from chilling next to nature you could do far worse than enjoy it from the retro charm of a Vintage VW Camper. Car manufacture was very different in the 60’s and ‘70’s unlike today’s built- in- obsolescence vehicles, cars back then were built to last. VW T2 production halted in Germany in 1979 but VW Brazil ended their production of the T2c in 2013. Therefore you can now only ever buy a T2 second hand and this is a minefield for the uninitiated. Vintage VW Campers tried (by hiring in Cornwall) before they bought and still made plenty school boy errors. So learn as much as possible about them first and hire one to check you actually like driving them. It is a work-out for your shoulders, with no power steering and a braking system very different from those in modern cars. You also need to take an expert with you, if you are in the market for a second hand vehicle, to minimise those errors. So the enduring appeal just seems to grow and grow and the VW hire companies in Scotland and elsewhere allow everyone to experience the joy of campervan living. VisitScotland have identified that our domestic tourists continue to embrace ‘staycations’ and both domestic and international travellers are lapping up ‘glamping’ a more comfortable version of camping which can relate to campervans, tipis, pods, gypsy caravans and more. ‘Modstalgia’ is another trend which is here to stay, whereby people choose to have a nostalgic holiday with more modern comfort than they did in the past. So it could be going to the seaside they went to when younger and staying in a plush hotel instead of a B+B, or it could be choosing to upgrade from a tent to a campervan. Vintage VW Campers offer vintage style with modern comfort, allowing a great modstalgic holiday in Scotland throughout the year. Travelling in a Vintage VW Camper is unlike no other experience; in that everywhere you go people smile and wave at you. By getting behind the wheel of a T2, either hired or your own, you become part of a club. A very happy smiley club that likes to wave at each other. So why don’t you buckle up and start making memories you will want to hold onto forever?